THE GREATEST DAY EVER !!! I am referring to what we call Holy Week and the climax at the end of the week that some call Easter Sunday, Resurrection Sunday or Sunrise Sunday. The names are different but it means nothing in comparison to the what happened on that great day. The greatest event to ever occur for the entire human race. It is a day of new birth, regeneration, sacrifice, payment of our debt, purchase of our soul, and a new beginning for mankind. Maybe you thought your birthday was the greatest or the day you got married, your child's birthday, the day you graduated, etc. We dare not dismiss the importance of those very special events, they are great days filled with special memories. 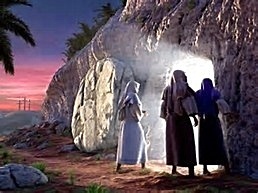 I am convinced and confident in knowing that the day when God raised His Son (Jesus) from the tomb (grave) is the greatest day ever recorded in the history of man. This confidence comes by faith because I was not there when it happened, but I believe it happened because the Word of God tells me. It is by faith that we please God, and our faith is the vehicle by which we can move mountains out of our way. 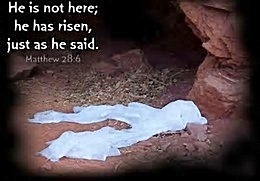 There were witnesses that the tomb was empty. Today billions of people around the world have the same belief and faith to believe without having been there in person. The Bible says blessed are those who believe and have not seen. John 20:29 "Jesus saith unto him, Thomas, because thou hast seen me, thou hast believed: blessed are they that have not seen, and yet have believed." Although everyone has the option to believe that Jesus died to pay for our sin and then rose from the grave on Easter Sunday morning and is alive and sits at the right hand of the Father interceding on our behalf, everyone does not choose to believe. In order to be in heaven and with God when you leave this world, you must receive the Lord Jesus Christ as your personal Lord and Savior. Not everyone goes to Heaven when they die. Just being a good person, or being a church member, is not enough. Only people who are in God's family enter Heaven. Receive Jesus Christ! 12 But as many as received Him, to them He gave the right to become children of God, even to those who believe in His name: If you receive Jesus, you become a child of God. Romans 10 tells you how. God loves you and wants you to be in His family. That is why Jesus suffered punishment for all people's sins. Jesus did nothing wrong. He did not deserve to suffer. But He died in your place -- so you could be forgiven and join God's family. 23 For the wages of sin is death, but the gift of God is eternal life in Christ Jesus our Lord. Eternal life is a gift -- not something you have to try to get. When you receive Jesus, you receive eternal life. Dear God, I come to you in the Name of Jesus to receive Jesus Christ as my personal Lord and Savior. I believe You raised Jesus from death after He died for me and is alive forever. Come into my life Lord Jesus and Thank You for dying in my place. Thank You for forgiving all my sins. 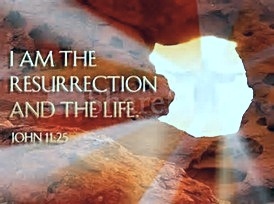 Thank You for giving me Your eternal life. Thank You Jesus, You are now my Lord.